Easily elevate two of your favorite potted plants for perfect air circulation using these Gardman Green Plant Caddies. Resting your potted plant on a trivet or caddy raises it off of the cold ground, ensuring excellent water drainage and preventing frost damage. 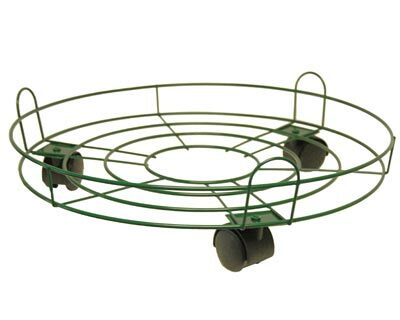 These generous, circular units can easily accommodate a planter up to 14" in diameter at the base, thanks to their coated wire construction and top support ring. The wires all extend from a central, 5" diameter circle, with additional wires adding structure and support to each piece. Three plastic casters on the base of each caddy allow you to reposition your plant in moments, and the green colored finish enhances your blooms. Display two potted plants perfectly with these Green Plant Caddies. Note: This case pack includes 2 of the Gardman Plant Caddies, Green, 16" dia.